Kaneto Shindo's 1968 ghost story is set for an October Blu-ray release. 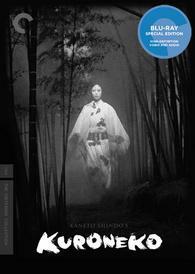 In an early announcement to retailers, Criterion says 'Kuroneko' is coming to Blu-ray on October 18. In this poetic and atmospheric horror fable, set in a village in war-torn medieval Japan, a malevolent spirit has been ripping out the throats of itinerant samurai. 'Kuroneko' ('Black Cat') is a spectacularly eerie twilight tale. The Blu-ray will feature a 1080p transfer, an uncompressed mono soundtrack, and supplements include: Video interview with director Kaneto Shindo from the Directors Guild of Japan; New video interview with critic Tadao Sato; Theatrical trailer; and a booklet featuring an essay by film critic Maitland McDonagh and an excerpt from film scholar Joan Mellen's 1972 interview with Shindo. You can find the latest specs for 'Kuroneko' linked from our Blu-ray Release Schedule, where it's indexed under October 18.